What is Book of Spells? The short answer is that it's a spell catalog for the Seven Voyages of Zylarthen universe, containing 296 spells presented alphabetically, approximately half of which are new to Zylarthen. Some of the old spells have been rewritten and shuffled around slightly among classes and levels. Thus, Magic-Users now have 216 spells - 30 per level for levels 1-6 and 12 per level for levels 7-9. And Witches and High Priests each have completely unique lists of 40 spells - or "powers" for High Priests. In the process, the Witch and High Priest NPC classes have been somewhat re-designed. Book of Spells also contains new rules for age and aging, a table for item saving throws, and an optional rule for higher-level characters doing extra damage. As with volumes 1-4, it exclusively makes use of the wonderful illustrations of John Dickson Batten - all "new" ones, so to speak. It's currently available on Lulu, in physical booklet form for $6.95 and as part of a revised Seven Voyages of Zylarthen Electronic Edition for $9.95. I'm going to break the longer answer up into three parts. Today I'll focus on Magic-User spells. Let me go back a step and describe what was done for spells in the original Zylarthen. In the foreword to Vol. 1, I implied that the game was based solely on OD&D's "three little brown books," published in 1974. That was true for classes, abilities and (roughly) the combat mechanism. But attentive readers of Zylarthen and these blog posts know that monsters, magic items and spells tracked the first two-years of Dungeons & Dragons, taking things through the late fall of 1975. Or, in other words, I made use not only of the three little brown books but also Greyhawk and the first four issues of The Strategic Review. Most spells were inspired by these sources. There were a few original ones, and we declined to use some others, most notably the upper-level Magic-User spells (levels 7-9) of Greyhawk and roughly half of the Illusionist spells of Strategic Review. Of the spells we used, Magic-Users got all of the Magic-User spells and some of the Cleric spells. NPC High Priests (clerics) got a list similar, though not identical to, the OD&D list, the bulk of it shared with Magic-Users. Witches got a mix of the most "witchlike" Magic-User, Cleric and Illusionist offerings. Again, a few were unique, but most were shared. Magic Users: 120 spells (20 for each of levels 1-6). 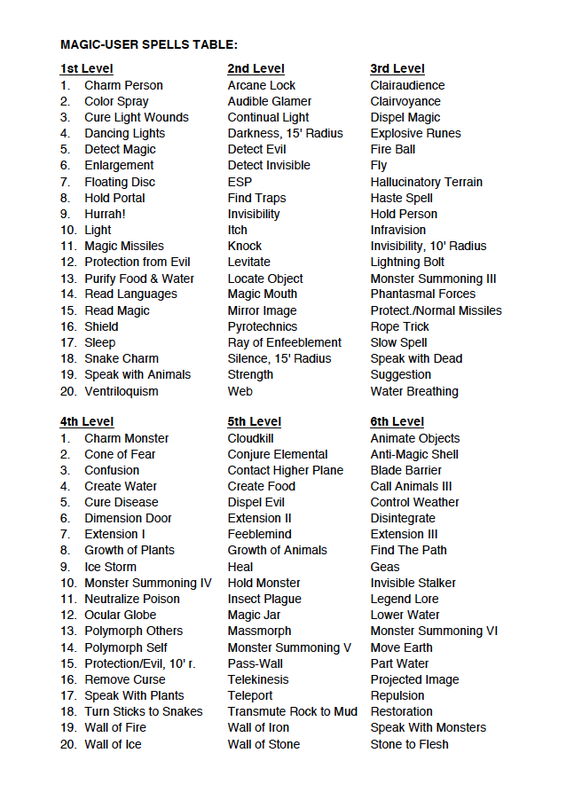 Evil High Priests: 36 spells (5 for each of levels 1-3, and 7 for each of levels 4-6). High Priests: 36 spells (5 for each of levels 1-3 ,and 7 for each of levels 4-6). Witches: 60 spells (10 for each of levels 1-6). However, if you took out the overlaps, the number of distinct spells equaled 150. Out of the 132 Priest and Witch spells, only 30 were unique to those classes. For Book of Spells, we added the high-level spells in Greyhawk and expanded the time frame through mid-1977, thus stopping right before the start of the publication of AD&D. The additional sources we tracked were Eldritch Wizardry, Gods, Demi-Gods and Heroes, the Holmes Basic set, and two articles from early issues of Dragon magazine. Not all the Dragon spells were used, and we should note that for spells not in the 3.5 or 5.0 SRD, if we used them, we were pretty careful to use them as jumping off points only, re-imagining and (usually) renaming them, at least in so far as their names and effects were not obvious, generic or taken from some other source - such as the Conan stories. 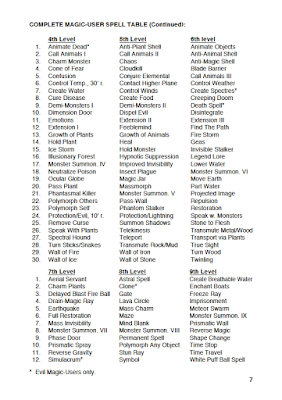 I'll discuss Witches and High Priests in more detail in parts 2 and 3, but the idea was to give them completely unique lists, letting them keep a few of the OD&D spells, but transferring the bulk to Magic-Users. 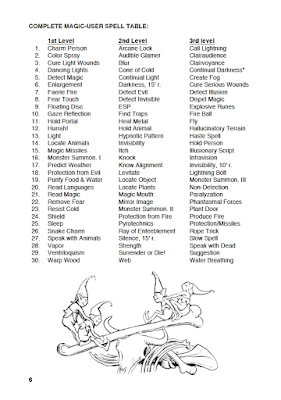 This time, a larger number of spells (perhaps 70 or so) were either original to me or re-imagined (and usually renamed) from another early TSR game. OSRites will easily be able to identify it. The idea was to really make Witches and High Priests different from Magic-Users, as well as more witchlike or priestlike (though my angle on priestlike may surprise a few of you), while letting Magic-Users have 95%+ of the OD&D spells. Giving the vast majority to that player-character class seemed like the right thing to do. 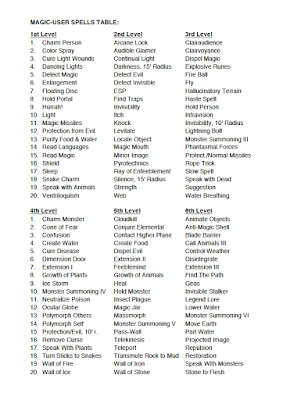 Magic Users: 216 spells (20 for each of levels 1-6, and 12 for each of levels 7-9). High Priests (including Evil High Priests - there is now technically no distinction in the spell lists): 40 - not separated by level. Witches: 40 - not separated by level. So, many of the "new" Magic-User adds were Druid spells from Eldritch Wizardry (I always liked the spells but hated the limiting nature of the class - at least for player-characters) and the left-out higher-level spells from Greyhawk. But I don't want you think that Book of Spells was merely an exercise in mashing those spells in (there wouldn't have really been a point if that had been the case). Rather, the parts and the whole had to work for the vibe of the game and for how "magic" would now be separated from witcheries and the deity bestowed "powers" of priests. I also took the opportunity to "fix" a number of spells that I either felt were broken or whose descriptions were annoyingly vague or unclear. I have to admit that the first three require the forthcoming Book of Fiends to be understood or used, but I'll post the necessary monster descriptions on this blog in the next few days. As with the original Zylarthen, two versions of Raise Dead were reworked into super-healing spells. There are still no Wish spells (you have to have a ring or perhaps a sword for those). And there are only one-and-a-half spells from the set of "Phantasmal" illusion offerings - I had always felt that too many illusions and "I disbelieves" always threatened to ruin things. 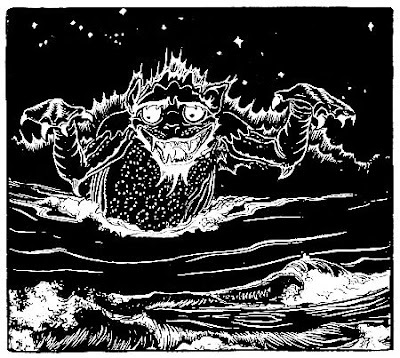 "White Puff Ball Spell" was TSR's Gods, Demi-Gods and Heroes name for a spell described in the (now public domain) Conan story, "The Black Circle." Since TSR sort of lifted the spell from the story at a time when the story was not public domain, and subsequently permanently deleted it, I felt that using their wonderful name for the effect in the now pubic domain story was fair game. Alas, since Forlorn Incistment (another Gods, Demi-Gods and Heroes spell name that TSR lifted - though with a different spelling - and then deleted) is from a work not yet in the public domain, I followed TSR's route in AD&D and the SRD in renaming it as the much more boring "Imprisonment." I like the new Magic-User lists a lot. I feel that there's a great mix of spells at each level - from offensive to defensive to just useful to weird to, in a few cases, downright creepy. And while some "balance" is good - in determining which level to assign a spell to, for example - the overall goal was to make things fun. 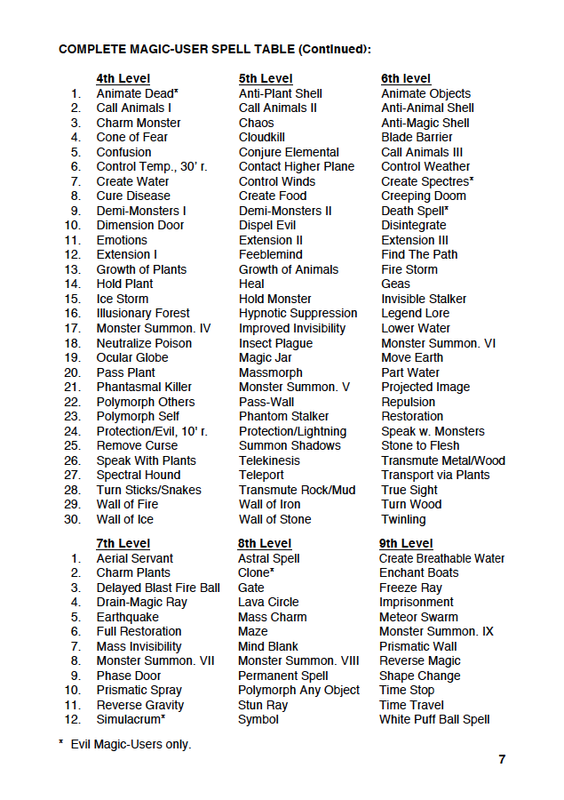 See the end of this post for page scans of the full Book of Spells Magic-User list. A word on round/turns: I don't really want to get into a big argument about this here, and I know that some people I respect hold a different position, but I came to feel that breaking time units down into rounds/turns as opposed to the more elastic conception of turns/melee turns/full turns was actually what Gygax and Arneson intended back in 1974, though their presentation was certainly confusing. In other words, rounds/turns was NOT a "naturalistic" accretion of AD&D. (Thinking that it was was the main reason I didn't originally go with it in the original Zylarthen.) But perhaps more importantly, Since Zylarthen's first publication, I came to feel that using an explicit rounds/turns scheme for spell duration was much less potentially confusing. So, for Book of Spells and the revised Book of Magic ALL spells were rewritten using the rounds/turns methodology. I imagine this will make some people happy while annoying a few others. But there it is. At the same time, for Book of Spells and the revised Book of Magic, I got rid of most instances where spell range, duration or effect varied according to level. I now feel that such variances were an illegitimate accretion from the original Vancian inspiration, even if they were present, at least to a small degree, even in the 1974 booklets. Finally, how does Supplement I: Book of Spells impact the already existing Vol. 3: Book of Magic? I elected to port rewrites and changes from Book of Spells back to Book of Magic, thinking this would be the least confusing alternative. In other words, purchasers of the new Electronic Edition of Zylarthen or the revised physical booklet of Book of Magic will notice that the Magic-User spell lists and descriptions in Book of Magic are slightly different from how they used to be. But Book of Magic still only has 120 spells for Magic-Users, and stops at 6th level. Sleep is a bit less of a mini-nuke, but in return you get Color Spray, multiple Magic Missiles (though they still DON'T hit automatically) and if you use Book of Spells, you can now summon a Goblin, Giant Centipedes or even Green Slime (whatever the referee determines that to even mean) to do your bidding. Unless you end up with a Butterfly Rabble. 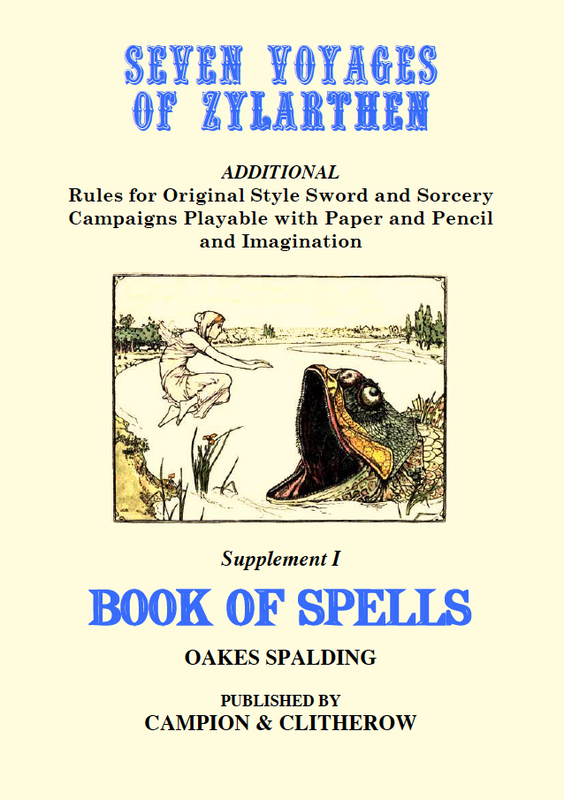 Book of Spells for Zylarthen Released! It's been a long time coming, but I've finally released Book of Spells, the 1st supplement for Seven Voyages of Zylarthen. It's available in booklet form and as an "extra" in the also newly released Zylarthen Electronic Edition, which consolidates revised versions of the first four volumes in a bookmarked 336 page PDF file. Book of Spells, the first supplement for SEVEN VOYAGES of ZYLARTHEN, almost doubles the number of spells in the ZYLARTHEN catalog from 150 to 296. Part of the idea was to continue the process of “re-imagining” the original fantasy adventure game through the midpoint of its fourth year, at least for spells. Thus, some of the “new” spells will be familiar. Many of them were originally designed for a particular player-character class not available in ZYLARTHEN, although its more sinister non-player character relative survives (see Vol. 2 under “D”). Our own view is that the spells were wonderful, but the player-class itself was limiting. We think they work better if they simply expand the choices for all Magic-Users. 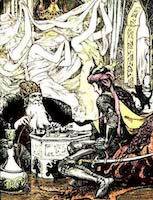 We also somewhat redefined the ZYLARTHEN Witch and High Priest classes. 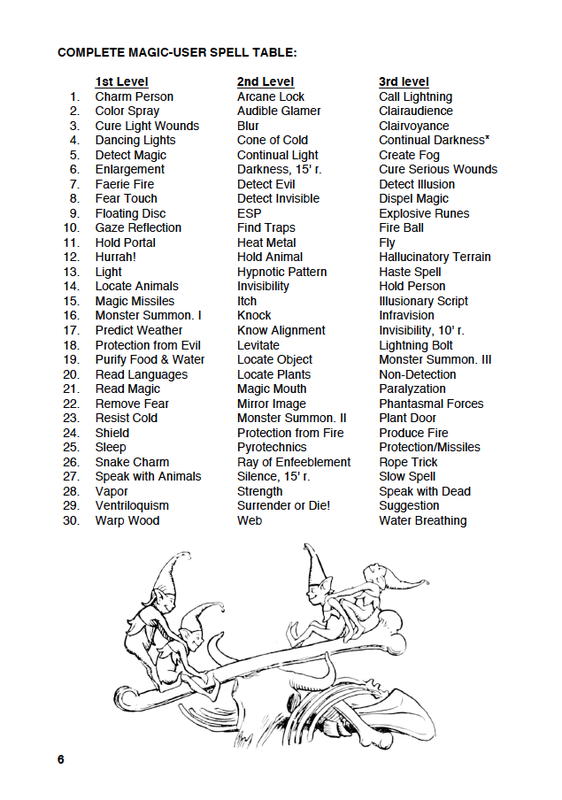 Both now have unique lists of spells—or “powers” in the case of High Priests—the majority of them being new to the universe of ZYLARTHEN as well as the original fantasy adventure game. We feel that the Witch spells make Witches more Witch-like, and the High Priest powers make High Priests more . . . perhaps alien is the right word. In the process of conceiving Book of Spells we’ve also slightly rewritten many of the spells in Vol. 3 and changed the level of a few of them to better comport with the range of the expanded list. The duration for most spells is now defined in terms of “rounds” (10 to a turn) or “turns” (6 to an hour), as opposed to the more elastic scheme given in the original. Spells and powers are listed in alphabetical order. 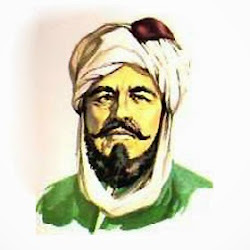 All are fully compatible with ZYLARTHEN as first presented. Revised rules for movement and time, tables for age and aging for player-characters (especially useful when assessing the effects of attacks by Ghosts and the like) and item saving throws (for all sorts of unpleasant situations) have also been provided. Finally, there is an optional rule for increasing the damage rolls for high-level player characters—if the players or referee feel that the original ZYLARTHEN scheme places them at a disadvantage against higher-level monsters with multiple dice of damage. I'll be going into a bit more detail on what I did in Book of Spells, as well as discussing the Electronic Edition in subsequent posts. I'm happy with the results, and I hope you will be too. If you would like to purchase either product (just in time for Halloween! ), you can currently find them at the Zylarthen page on Lulu. (The Zylarthen box to the right will also bring you there.) But this time I also intend to offer both products at two other sites as well. Cheers! And may you always find yourself upwind from a White Puff Ball spell.